as, per the commenting message below, the new and fantastically improved website (version guttersnipe point phlox) is still in the oven, i can't actually converse with you about my travels, dear ones; i can, however, present with great pride a shot of joe on our balcony in reykjavik, brandishing one of the sparklers i smuggled through three countries. 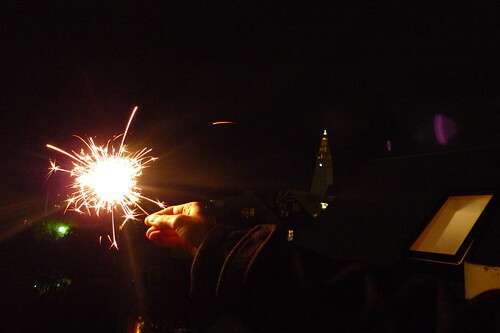 the lights floating above joe's elbow are the observation tower at hallgrimskirkja. kidchamp dot net: affection, fireworks, and points of light on foreign shores.